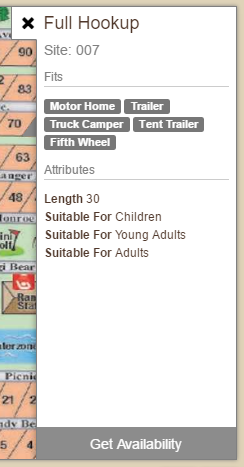 All sites are based on 2 adults. Only one tent or RV unit and one car per site. Additional tents require an additional site. Extra adults $6.00 and children $3.00 (Ages 3-17) nightly. 13% sales tax will be applied on the total fee. One night’s deposit required on booking. Two (2) night minimum stay on all summer weekends. Cancellation fee is $10 per booking if cancelled more than 2 days prior to arrival. Full deposit is forfeited for cancellations within 2 days of arrival. 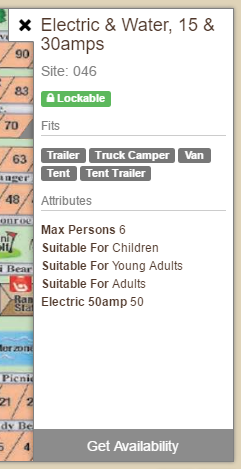 Rentals are based on 2 adults and 2 children. Extra Adults $9.00 Extra Children (ages 3-17) $5.00 nightly. 13% sales tax will be applied on the total fee. 50% deposit required on booking. No pets or smoking allowed. Two (2) night minimum stay. Three (3) night minimum stay on summer holiday weekends. Cancellation fee is $30 per booking if cancelled 14 days prior to arrival. Full deposit is forfeited for cancellations within 14 days of arrival. In order to lock in your site number request there is a $20 fee. There are absolutely no refunds on the site locking fee - this includes cancellation of reservations, changing of dates, or dissatisfaction with the site you chose. We do not lock in site requests for our Park Model Trailers, Cabins, Cottage, Yurt, Habitat or Lodge rentals.